So you want to breed, and your dog passes conformation, temperament, health and genetic testing. First you have to find a compatible/non-related stud, with all the same background testing as your female, i.e. conformation, temperament, health, genetic testing and good non-related pedigree. The general goal when you breed is to better the breed. That is the MAIN reason to breed. Breeding is NOT as easy as it looks. Lack of experience can risk the life of your dam, and having puppies just so your children may witness the miracle of birth can sometimes go badly. Be prepared for anything that could happen; ask yourself: "How can I handle things if they go wrong? Is it worth it?" Most breeders do not simply follow textbook instructions when whelping a litter because whelping correctly requires experience. There is no money to be found in breeding the right way; it is a hobby and usually costs money rather than makes money. Many unexpected costs can break your bank, it is absolutely necessary to have funds set aside in case there is trouble with your dam during her pregnancy or whelping. Twenty-five percent (25%) of dog births end up middle-of-the-night C-sections, which adds up to a $1,000 vet bill just for the whelping. Fading puppies can also cost several thousand dollars to save, and it is very possible for puppies to contract viruses such as mild Cocciadia, Giardia, and the more serious threat of Parvo. It is possible your dam will not produce milk, or make too much and end up with Mastitis. Your dam could also hemorrhage. Not too long ago a Shih Tzu breeder asked me for advice about their toy dog. The dog was very, very pregnant and the owner was worried. Toy dogs usually have four to five puppies, with eight being a large litter. They went to the vet close to the due date, and x-rays showed many puppies, nine, maybe more. Three days before her due date the breeder was very worried that she could not go any longer. She called a couple different vets and went in to see a couple different vets and they all said to wait till she went into labor. The next morning the dam (mother dog) was having trouble breathing. Her temperature went up to 103 (temp should be 98 to 101), and had been 98.5 the night before, which means labor is soon. Even though the vet said to wait, the breeder went to the vet’s office to request assistance. The dam and all 11 puppies passed away soon after arriving at the vet’s office. That morning the doctor did everything she could to save them. This breeder had done everything correct during her mother dog's pregnancy. Pictures taken a week before the dam passed away. Why did she die? Her system seemed to just shut down. She just went to sleep. Either she was low on calcium, which you are not supposed to give a pregnant dog, but you need to for a large litter as you are likely going to need a cesarean anyway, or her system just could not take the pressure, and was shutting down. Or maybe she was going toxic. On delivery of the puppies, one pup of the 11 seemed to have died a few days prior, as the skin was flaky, so there is a chance of a pup dying and the dam going toxic. Breeding your dam is risky and this happened to an experienced breeder who did everything correctly. Even the three vets that were involved were shocked, as they thought nature would take care of itself and accommodate the pups. Nature did take care of this itself, in a sad, sad way. This could have been pregnancy toxemia which happens with large litters and dogs that stop eating in the last trimester. They have low blood sugar, liver problems, and quite often the only treatment is ending the pregnancy. Even then sometimes a C-section is potentially fatal. Here is another sad case reported. 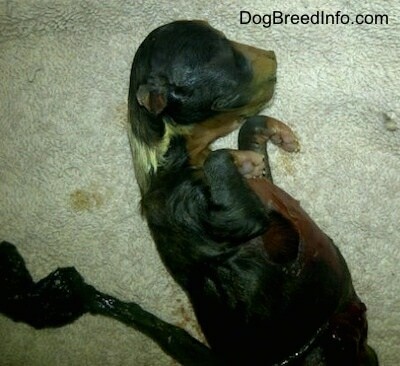 The first two pups in this litter were born dead. The third puppy was born a runt. The pups in the other horn were fine. By the look of the dead pups it is clear they had passed away a while back inside the dam. The breeder really had to feather to get this puppy out and then the rest came very fast. This pup held up the litter and risked the lives of all the pups and the dam. The list of sad possibilities goes on and on. Are you ready for the financial and emotional burden breeding could become?